Goodreads says, "As sisters they share an everlasting bond; As queens they can break each other’s hearts. There is only one bond that I trust: between a woman and her sisters. We never take our eyes off each other. In love and in rivalry, we always think of each other. When Katherine of Aragon is brought to the Tudor court as a young bride, the oldest princess, Margaret, takes her measure. With one look, each knows the other for a rival, an ally, a pawn, destined—with Margaret’s younger sister Mary—to a sisterhood unique in all the world. The three sisters will become the queens of England, Scotland, and France. United by family loyalties and affections, the three queens find themselves set against each other. Katherine commands an army against Margaret and kills her husband James IV of Scotland. But Margaret’s boy becomes heir to the Tudor throne when Katherine loses her son. Mary steals the widowed Margaret’s proposed husband, but when Mary is widowed it is her secret marriage for love that is the envy of the others. As they experience betrayals, dangers, loss, and passion, the three sisters find that the only constant in their perilous lives is their special bond, more powerful than any man, even a king." 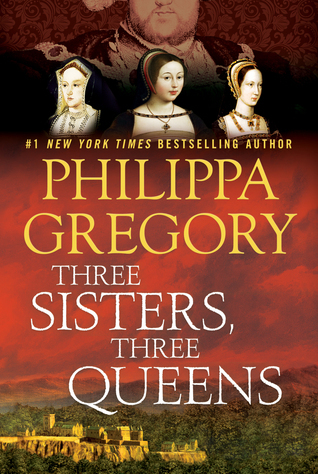 Philippa Gregory is my go-to historical fiction author and I love the sound of her latest novel, especially because I don't know much about Margaret Tudor. What do you guys think? I think this sounds entertaining and I love Tudor fiction. My only issue is that her books are usually not very historically accurate. I'd like them more if I could get over that! Yes, I have heard both arguments...that they are well-researched and others have said they aren't accurate. I just read them for the drama! :) Haha. Thanks for visiting, Christina! Oh, it's been a while for me. Thanks for putting this on my radar! You're welcome. Thanks for visiting, Joy! This sounds very interesting. I just started reading historical fiction over the past year or so and have really enjoyed it. I hope you enjoy this one! I will definitely check out some reviews. I definitely recommend Gregory! Thanks for visiting, Jacque. I don't read too much historical fiction, but I hope you enjoy this one! Have a great week! I know, right?! I love all the drama. Thanks for visiting, Jenny! It sounds very interesting to me!! It is a new one for me so thanks for sharing! You're welcome. Thanks for visiting, Priyanka. I definitely want to read this one. Looks fascinating. Enjoy! I agree. Thanks for dropping by, Heather. I know, right?! I am all about that. Thanks for visiting, Becky. Phillipa Gregory is one of my FAVORITE historical authors! This one looks amazing! My Waiting On Wednesday is here, if you'd like to stop by! I'm a new GFC and Bloglovin' follower. Me too! Thanks for visiting and following. I appreciate it.